Cry Freedom! 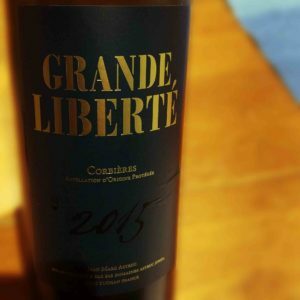 This Grande Liberte is so named as it’s the first wine that the wine maker has made under his own label. Whilst the family has been producing wine for the local co-op for 100 years, this one is intended to stand on its own. It comes with a nice back story of local wild boar chomping away on under ripe grapes from the lower reaches of the vines, helping the higher fruit to develop more intense flavours. I wasn’t wholly convinced by the story, inexpensive Corbieres can be a little, well, agricultural, and a bit of extra budget had gone into a nice, heavy bottle. Grand Liberte Corbieres ’15 was a deep, dark red colour, and it didn’t smell of much so I figured it would benefit from a little air. I gave it a bit of a swirl in what’s best described as an express-decanter, but a little more time in a regular decanter or a pour through an aerating gizmo would do the trick. After that and a little bringing up to temperature it smelled of rich dark fruits. It’s dry with a medium acidity and a mix of tannins, there’s lots of soft and just a tiny hint of green – those boar must have missed a couple of stalks. It’s medium bodied with a good slug of alcohol, around the 14% mark. That has quite a warming effect and seems to accentuate the spicy pepperiness, with bit of herbiness too. The fruits are a bit redder in the mouth, still blackberries, but with a more raspberry or even redcurrant flavour joining in. The flavour lasts quite well, moving from the high herb taste that’s maybe a bit sharp, not quite reaching bitter, through the stewed fruits and into the spice. At £11 a bottle from Naked Wines I thought this was reasonably priced and a good example of Corbieres at that price point. It’s a good winter evening in front of the fire bottle.